When the strike was over, Cain had a spell of unemployment as there was a dispute with a colliery manager in that ‘he said I could have my work back, if I gave up my policy of socialism’ (pg 8). This emphasises how much socialism had an effect on the mines as there was real conflict in ideologies of the workers and the managers. Cain then spent a time doing manual labour and working as a navvy on the footpaths by the ‘gassy gutter’ and along the ‘quarry road’ as that was the only work he could get since he refused to abandon his socialist views. 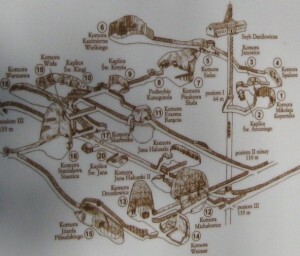 Map of the Wieliczka Salt Mine in Poland that Cain visited. Cain shares an anecdote about how his work took him to Krakow, Poland to the International Miner’s Congress in 1930. He shares details about visiting the Wieliczka Salt Mines and how he ‘saw the producing of the salt, and also saw it washed and then brought to the surface to the refinery’ (pg 8). This brief story shows that mining was a major part of Cain’s life, even away from home. When he returned, he still couldn’t attain any work until after the Wingate Colliery closed in the June of 1930. Things took a better turn as he was employed by J.A Stewart as a clerk in the Ministry of Labour, Wingate, where he stayed until 1934. After this, he was elected with another man, Sir William Lawther as Checkweighman at Wheatley Hill Colliery a role in which he kept until his 66th birthday (pg 8). When he returned to the colliery he was made secretary of the Miner’s lodge, and he writes ‘I spent a lot of time dealing with the unemployed’ (pg 8). 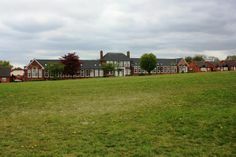 Easington Council in 1934 and became governor of the A.J Dawson Grammar School. He was said to have ‘done all in his power to promote it’s welfare’. This was the last work that Cain had before his retirement. His opinion was valued enough that in 1950 he was invited out to Nigeria by the Secretary of State for the Colonies to help advise ‘on conditions of labour in the new mining industry’ that was being set up. Cain writes this in his memoir as he recalls the report that was written about himself in the celebrations of the Silver Jubilee of the school he was governor of. Because of the work he did in his community and his proactive approach to helping the miners and the unemployed in County Durham, he was awarded an MBE for his services in 1967. 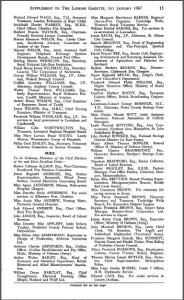 His name appears on the honours list in the London Gazette for this achievement, which is an astonishing feat, but also a fitting way to commemorate all that Cain did throughout his working life. Moore, Robert. S. Pit-men, Preachers & Politics: The effects of Methodism in a Durham Mining Community. 1979. Cambridge University Press, Cambridge. One Response to "Edward Cain (1891-1978): Life and Labour – Later Years"